Angry Birds: What’s Up With This Trumpeter Swan? This past weekend we went for a nature walk at Tommy Thompson Park on the Leslie Street Spit here in Toronto. 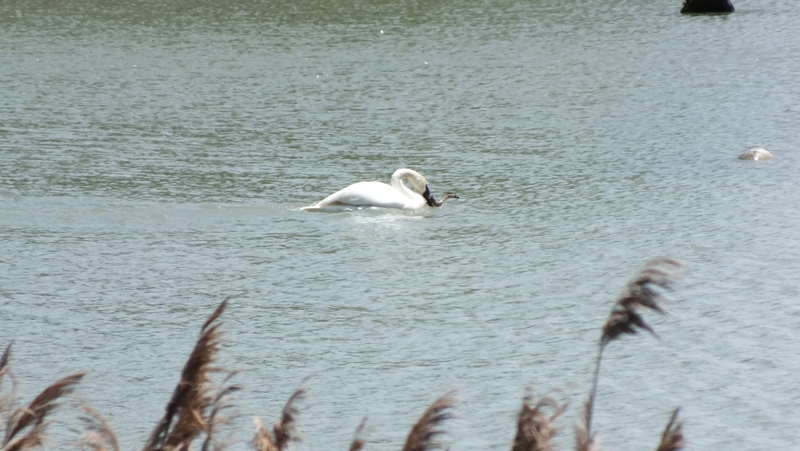 I’m going to write more about the spit and what we saw there later this week, but today wanted to get your thoughts on what’s going on with this trumpeter swan. 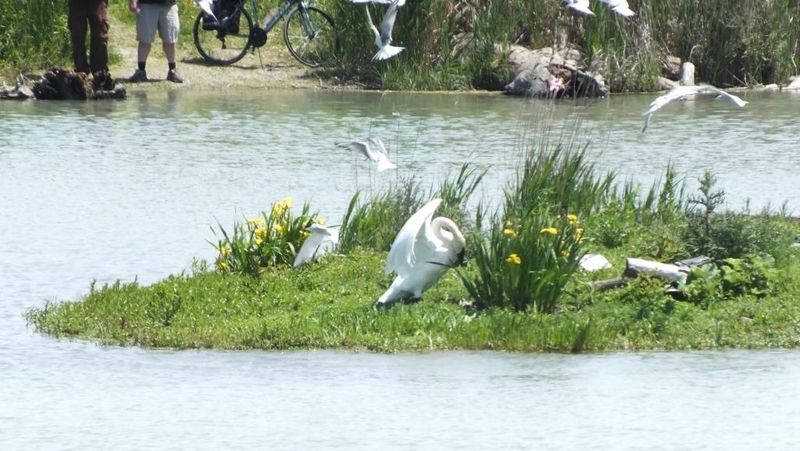 We had seen a pair of swans sitting on what we assumed was a nest tucked into the grass on the shoreline of this inland lake. All of a sudden there was commotion in the water and one of the swans seemed to be battling with something below the surface. I grabbed my binoculars and Barry grabbed the camera and started shooting. They were quite distant (these photos are at full zoom) and we couldn’t get a fix on what the huge bird was fighting with. Whatever it was kept surfacing and it seemed that the swan was pushing it under. It went on long enough that people were stopping to watch. 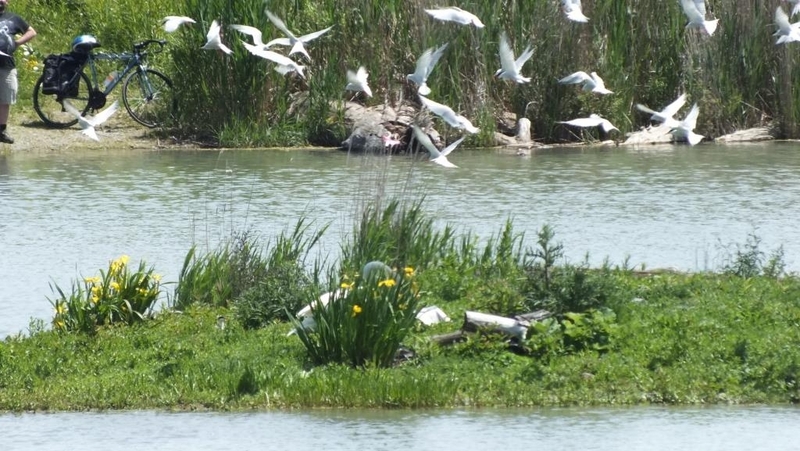 One woman commented that swans will fight snapping turtles that way. I had my doubts but kept watching. I know that swans will aggressively defend their nests, but this seemed to be going on a long time. The swan was not letting up. A couple times it looked like the swan was holding something by the neck. A duck maybe? 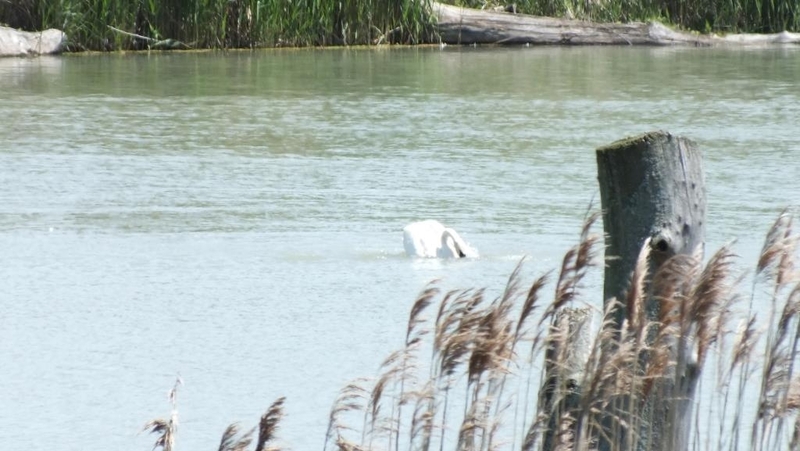 A man announced that he had been watching swans for seven years and have “never seen anything like this.” We kept watching. 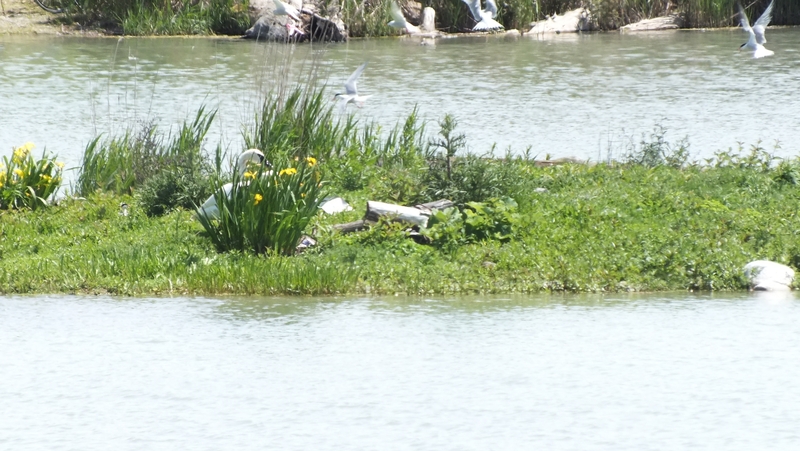 Finally, the battle move towards a small island in the middle of the lake where dozens of terns were nesting. 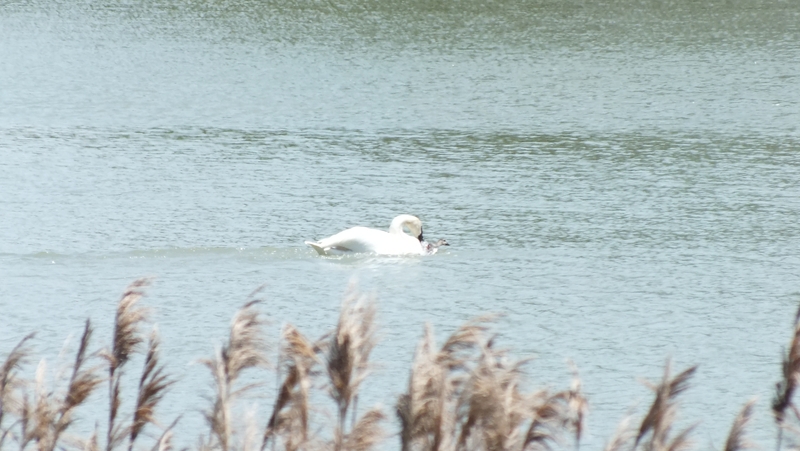 And whatever it was, the swan seemed to deposit it (or chase it?) onto island, causing commotion (consternation?) among the terns. 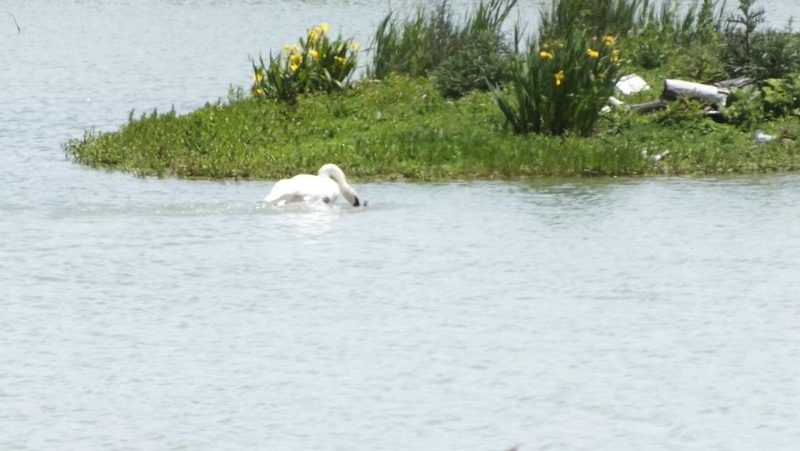 After which, the swan swam calmly back to its nest. The whole event had taken about 5 minutes according to the time-stamps on my photos. After another few minutes or so the terns settled down and all became quiet on the island. There was no movement from where we thought the victim was. When we got home I wanted to see exactly what this swan was defending its nest from. But looking at the photos I was left puzzled. Now I want you to take a look at these and tell me what you are seeing. I’ve uploaded them full-res, so you can click to enlarge. You can see the victim just to the right of the bunch of flowers. In the next shot, taken 15 seconds later, it’s not visible. I think I’m going to invest in the better lens for my camera. NextSweetfern Update: Red Tape Cleared, Now Up She Goes!